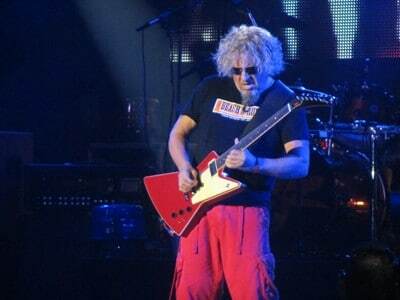 I have never been a huge Sammy Hagar fan, but have always enjoyed his work with Van Halen and Chickenfoot, as well as his stellar song “I Can’t Drive 55” from his 1984 ‘VOA’ album. 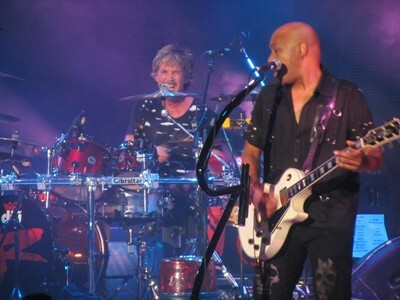 I have seen Hagar play live with Van Halen — or should I say ‘Van Hagar’ — and twice with Chickenfoot, so when I found out he was touring with his solo band dubbed the Waboritas and playing songs from throughout his career, I made sure that I purchased a ticket right away. Why I bothered, I don’t know — because the Molson Amphitheatre had to be, unfortunately, at about half capacity for Hagar‘s show. There appeared to be not a soul in the uncovered lawn (upper section) and 400 sections of the venue. Even the 200 section, where my ticket was located, had lots of empty seats by the time that I got to the venue just as opener Kim Mitchell was wrapping up his set with “Go For Soda”. The empty seats turned out to be a blessing for me since I had no problem ‘upgrading’ my ticket by getting to the front of the section. With some good timing to evade the security guards’ watchful eyes, I could have even snuck into the lower floor (which was filled with seats) of the venue. I should add that as an extra bonus I received notification from Ticketmaster, perhaps a month prior to the Sammy Hagar show, that with my concert ticket purchase I would be receiving a copy of the frontman’s latest CD whenever it comes out in September. I was quite surprised to see how small that Hagar‘s stage set was — it had to be the smallest that I had ever seen at the Molson Amphitheatre. Certainly, when compared to the stage show brought by KISS only a month ago at the same venue — and considering it was likely filled at half capacity for Hagar‘s show — it appeared that a smaller more intimate venue would have been far more appropriate for Sammy Hagar to play this evening. Sammy and the Waboritas kicked off the night with a trio of Montrose era songs — “Space Station #5”, “Rock Candy” and “Bad Motor Scooter”. At the beginning of the show, Hagar simply presented whichever song that he was playing by calling which year the song came from. He also promised that he was going to play for a very long time. Never having been a big Montrose fan, I enjoyed the three first songs but hoped to get out of the ’70s era as fast as possible. 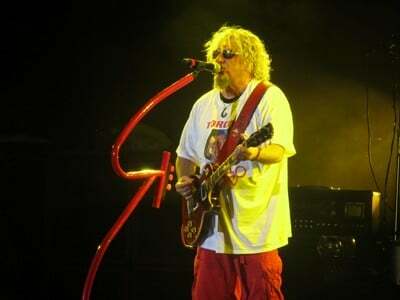 Alas, Hagar called 1976, meaning his solo song “Red” would be played. Luckily, the next two years that were announced were 1984 and 1981 (or did Sammy say 1982? 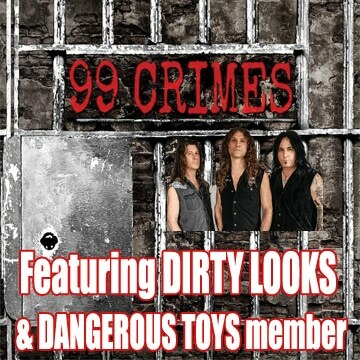 ), meaning that my two favorite Sammy solo songs would be played — “I Can’t Drive 55” and “There’s Only One Way To Rock”. That is when the show started going in a higher gear for me. Unfortunately, just as I was really starting to enjoy the show, Hagar came back with two solo songs that I was unfamiliar with — “I’ll Fall In Love Again” and “Your Love Is Driving Me Crazy” — and that I will not be ‘discovering’ or revisiting anytime into the future. The always solid riff based “Three Lock Box” followed and I started looking forward to the Van Halen portion of the show. Hagar seemed to really be enjoying himself up on stage and his positive vibes were quite contagious. Unfortunately, life in Cabo and California has been too good to Sammy over the years so he looked visibly overweight. He even candidly admitted to having gained a few extra pounds over the years when a fan tossed him one of the biggest sized white t-shirts that I had ever seen. 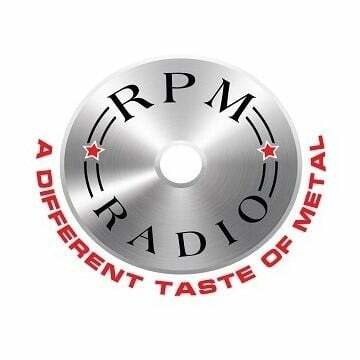 My favorite Sammy Hagar led Van Halen tune was next — “Right Now”. Sadly, rather than hearing the beautiful piano or keyboard intro, guitarist Vic Johnson played the intro on his guitar. Yikes… that sort of sucked. The song was played somewhat differently and was nowhere as good as the original version. 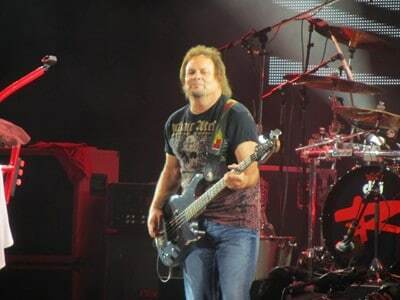 To make matters worse, Michael Anthony had yet to be seen — wasn’t he supposed to play on all the Van Halen songs on this tour? 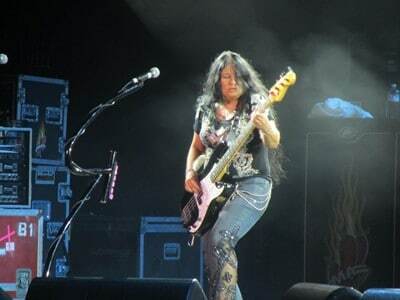 There was even a bass solo — yes, a bass solo — played by Mona Glader during “Right Now”. Clearly, this is not how I had wanted to hear this song. Luckily, Michael Anthony, or ‘Mikey’ as called by Sammy, finally made his way onto the stage and I don’t know whether it was his presence or simply the rest of the songs played, but the concert really seemed to get a lot better upon his arrival. Four Van Halen classics were then played — “Why Can’t This Be Love”, “Best Of Both Worlds”, “When It’s Love” and “Finish What Ya Started”. Anthony then disappeared from the stage and I thought that I would see him again when Hagar would surely crank out a few Chickenfoot songs. 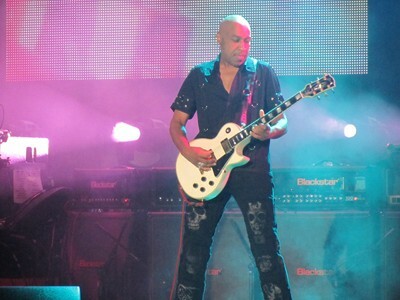 Another solo song, “Heavy Metal”, was next followed by the crowd favorite “Mas Tequila”, which had Anthony back on stage and the fans singing along. 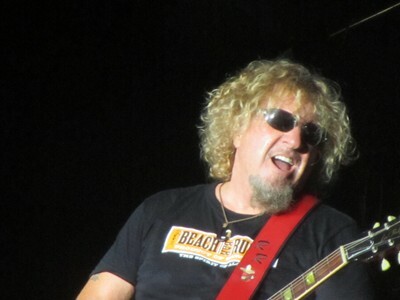 Hagar closed out the show with “Knockdown Dragout”, the first single from his upcoming new CD ‘Sammy Hagar & Friends’. The encores were the stellar “Eagles Fly Free” and another surprisingly good new song “Bad On Fords And Chevrolets”, from the upcoming album. Unfortunately, this was the end of the show. Hagar did get the crowd going with an acappella version of Van Halen‘s “Cabo Wabo”, which was cool to hear, but what about Chickenfoot era songs? 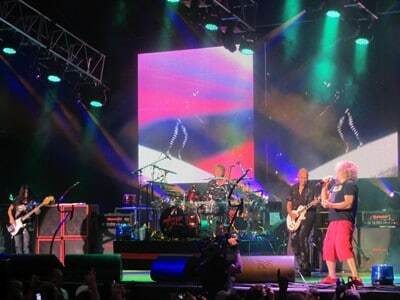 Having Sammy play some Chickenfoot tracks with Michael Anthony should have been a no-brainer! 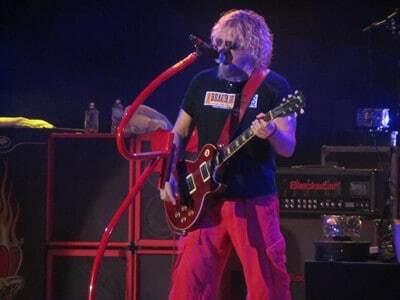 Had Hagar finished off his show with Chickenfoot classics such as “Big Foot” and “Oh Yeah”, the gig would have been a lot better and ended on a bigger high. The show was also a little shorter than I thought, clocking at only about 90 minutes, despite Hagar‘s assurances at the beginning of the night that he would play for a very long time. 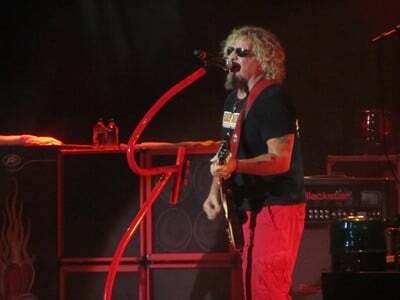 At the end of the day, I was happy to see Sammy Hagar & The Waboritas play live, but may well not make it back for another Hagar show unless he tours with Chickenfoot or has another Van Halen reunion. 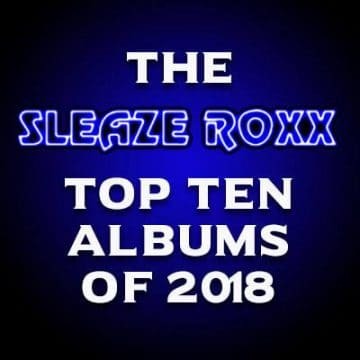 I will give a lot of credit to Sammy for taking Michael Anthony on tour with him — the bassist deserves a lot better than the shabby treatment that he has received from the Van Halen brothers, and to have Wolfgang Van Halen essentially steal his spot in the David Lee Roth fronted reunion has been a real pity. Obviously, Anthony does not have the drawing power or pedigree to headline a show at a venue such as the Molson Amphitheatre, but having him appear on stage with Sammy Hagar for select songs certainly added to the show in a big way — so kudos go to Sammy for doing the right thing!